Spiritus Financial is physically located in the heart of wine country in beautiful Northern California, so we love when our clients come meet us in person. 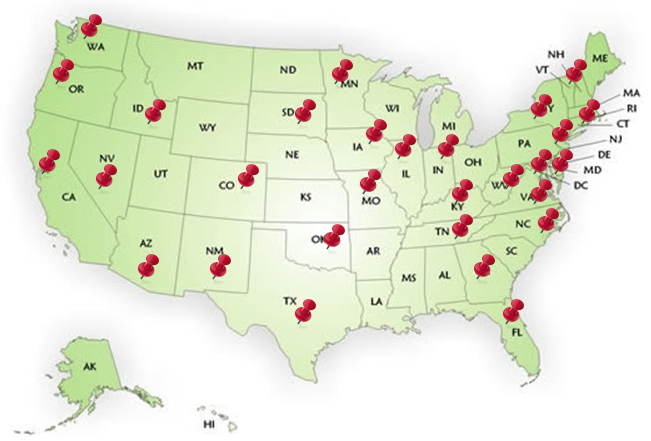 But since our clients live next door, across town, out of state (see map below) and across the country, we have integrated video conferencing into the process of developing your retirement plan. That means wherever you are – home, office or traveling, if you have access to a phone and/or a high speed internet connection, we can work together via video conferencing. If you would like to begin a relationship as a Spiritus client, or just want more information, fill out our information form or contact us by email or phone. You don't have to live in Sonoma County to work with Spiritus Financial Planning. We work with clients from CA to NY and anywhere in between. Serving clients in 27 states so far, we'd love for you to be our next. Whether you're from Boise or Columbus, Billings or Boston - we can help.